이 지석은 백제 25대 왕인 무령왕과 왕비의 지석으로 2매이다. 이 2매의 지석은 왕과 왕비의 장례를 지낼 때 땅의 신에게 묘소로 쓸 땅을 사들인다는 문서를 작성하여 그것을 돌에 새겨넣은 매지권으로, 1971년 무령왕릉이 발견될 때 함께 출토되었다. 왕의 지석은 가로 41.5㎝, 세로 35㎝이며, 표면에 5∼6㎝의 선을 만들고 그 안에 6행에 걸쳐 새겼다. 왕의 기록은『삼국사기』의 기록과 일치하고 있다. 뒷면에는 주위에 네모나게 구획선을 긋고 그 선을 따라 12방위를 표시하였는데, 무슨 이유인지는 알 수 없으나 서쪽 부분은 표시하지 않았다. 다른 하나는 왕비의 지석인데 가로 41.5㎝, 세로 35㎝이며, 2.5∼2.8㎝ 폭으로 선을 긋고 4행에 걸쳐 새겼다. 선을 그은 부분은 13행이지만 나머지 부분은 공백으로 그대로 남겨 두었다. 뒷면에는 매지문(買地文:땅을 샀다는 문서)을 새겼다. 원래 매지권은 무령왕을 장사지낼 때 만들어진 것인데 그 후 왕비를 합장하였을 때 이 매지권의 뒷면을 이용하여 왕비에 관한 묘지문을 새겼던 것이다. 이 지석은 삼국시대의 능에서 발견된 유일한 매지권으로서 무덤의 주인공을 알 수 있게 한 것으로, 여기에는 당시 백제인들의 매장풍습이 담겨져 있어 매우 귀중한 자료로 평가되고 있다. 또한 무령왕릉에서 발견된 다른 유물들과 함께 6세기 초 백제와 중국 남조와의 문화적 교류를 보여주는 것으로서 백제사 연구에 귀중한 자료가 된다. These are two Stone Memorial Tablets for King Muryeong, the 25th King of Baekje, and his Queen Consort. 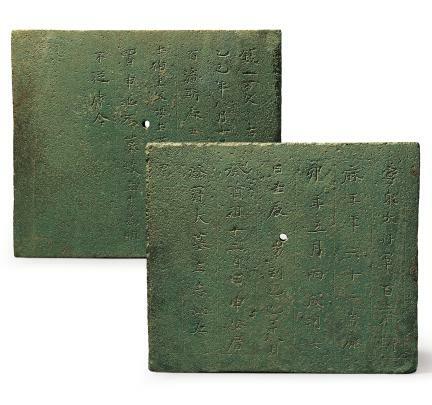 The front of the tablet is inscribed with 6 lines of record, each line measuring 5 to 6 centimeters. They coincide with the record of King Muryeong in Samguk Sagi (History of the Three Kingdoms). The back of the memorial tablet is inscribed with a square, which indicates 12 directions, except the west. The Queen's memorial tablet has 13 lines, of which only four lines are filled with inscriptions, each measuring 2.5 to 2.8 centimeters. 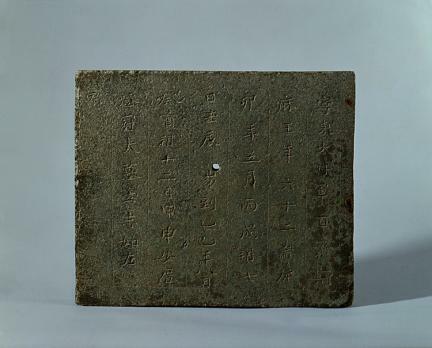 The back of the tablet is inscribed with maejimun (certificate of ownership of the land). Initially the certificate was inscribed on a stone tablet when King Muryeong was buried, and its back was later used for Queen's memorial tablet when she was buried next to the King. 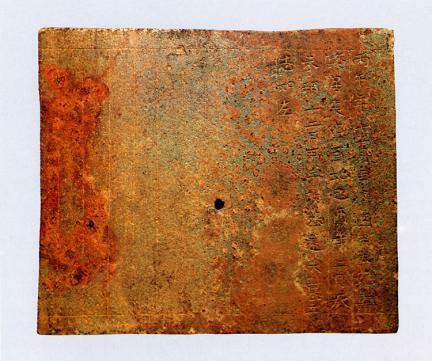 This memorial tablet is considered one of the most valuable relics, enabling the archaeologists to pinpoint the exact attribution of the tombs in the Three Kingdoms Era, as well as to understand the funeral culture of Baekje.